Fort Lauderdale, FL October 25th, 2017 – Today, the Yacht Group announces their strategic partnership with ACR Electronics . ACR’s most powerful searchlights will now be exclusively sold and further developed by The Yacht Group. These searchlights are called ‘Yacht Beams’ and are being designed and manufactured specifically to yacht and commercial vessel specifications. The Yacht Group’s innovative technology, coupled with ACR’s commitment to providing high quality emergency and survival gear, make the Yacht Beam the most powerful durable searchlights on the market today. Captains can confidently pierce through the darkest nights with The Yacht Beam’s series of one million and six million candela power. The lights are precision controlled via a military/commercial grade IP69 illuminating joystick (pending FCC approvals, expected shipments to begin in November*). In keeping with their long history of reliable wireless controlled products such as their Yacht Controller, The Yacht Group’s Yacht Beams will also have an optional wireless control. “We want to consistently provide a series of quality products with strong emphasis on safety at sea and through this partnership with The Yacht Group we are achieving that goal,” shared Gerry Angeli, President of ACR Electronics. “The Yacht Group’s proven control technology, strong field installation experience, and expertise in the yacht market has led to our strategic partnership in accomplishing this objective with ACR,” agreed Gerald Berton, President of The Yacht Group. 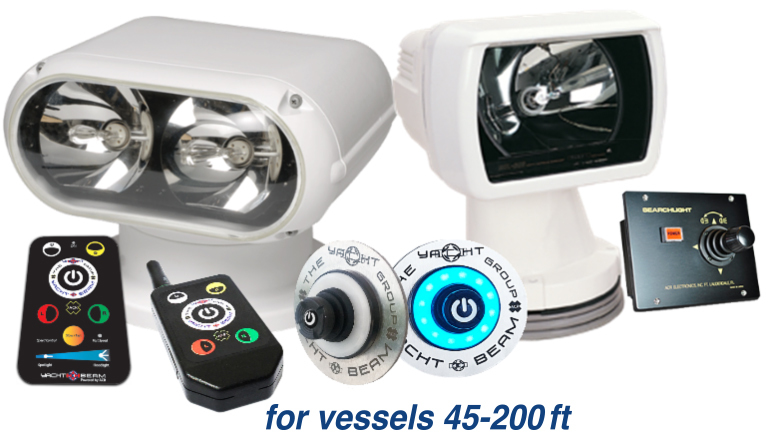 * New Yacht Beam Controllers are pending FCC, with an expected approval and shipping in November. Until approvals are obtained, these products have not been authorized as required by the rules of the FCC. The product stated in this release, ‘Yacht Beam’, may not be offered for sale or lease until authorization is obtained. • For sharing this content on social media please tag our accounts @theyachtgroup and use #yachts #searchlight or #FLIBS2017 in your post, so we can find and share your coverage. • If you require more information such as: product shots, logos or spec sheets please contact Isabel@theYachtGroup.com with your request. The Yacht Group team of products includes: Yacht Controller , Yacht Thruster , Yacht Graphx, Yacht Protector , Yacht Command and Yacht Beam . The Yacht Group brings the highest quality products, expertise, professionalism, and support to the yachting community. The hallmark of their brand is delivered through innovative technology to best serve the marine industry. The best boating experience and improved controls, which The Yacht group delivers, can be found on over 250 brands of all size vessels today. ACR designs and manufactures a complete line of safety and survival products under the ARTEX and ACR brand names including ELTs, EPIRBs, PLBs, AIS, SART, Strobe Lights, Life Jacket Lights, Searchlights and safety accessories. The quality management systems of this facility have been certified by TUV USA to AS9100C / ISO 9001:2008. Recognized as the world leader in safety and survival technologies, ACR and ARTEX have provided safety equipment to the aviation and marine industries as well as to the military since 1956. The company is headquartered in Fort Lauderdale, Florida and employs over 180 at its manufacturing facility.